Considering a new puppy gift basket for a friend’s new puppy? What a fun way to welcome a new canine family member, and until baby showers for new puppy parents become commonplace, it is an excellent way to show your affection and interest in the new puppy. But, why stop at the arrival of a new puppy? There’s a gift basket for all occasions and even for those days you just want to, well, make a little special. Who would appreciate a new puppy gift basket? Gift baskets are so popular that they make the perfect gift for just about anyone interested in dogs. To Buy Ready-Made or Assemble Yourself? 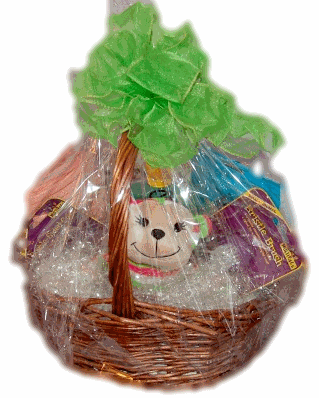 Puppy Gift Baskets are easy to purchase online in any variety of shapes and sizes. (See the one on the left available on Amazon.com. Some are ready made, come complete and packaged and can be shipped to practically anywhere. Other companies offer to assemble the contents based on your choices then wrap and send. You can even buy gift basket making kits that include the container, shrink wrap, fillers, ribbon, and a gift card—all you do is add the contents. The do-it-yourselfer will enjoy the opportunity to start from scratch and build the gift from the bottom up giving it their personal touches. Your choice is what’s right for you, the person receiving the gift, your time, and of course, your budget. If you love the freedom to create your own, it can be a creative fun project. Best of all, you have complete control of the products inside the basket. You can be extravagant or as budget minded as you like. Just the Essentials: You might decide to make your basket with all the essentials plus a toy or two and a couple of treats. This type of basket can include anything a new puppy might need bowls, a collar and leash, a new puppy manual, toys and treats, a brush or a bottle of tearless puppy shampoo. Gourmet Puppy Gift Basket: Maybe you want a gourmet gift basket with an assortment of treats, chews, and foods. Add a treat or two for the new owner and perhaps a coffee mug featuring a photo of the puppy’s breed. Spa Baskets: A spa basket could include some appropriate grooming supplies, heavenly scented shampoos or conditioners, a soft towel, and a few treats to calm a nervous new puppy. Training Basket: Maybe your idea of a great puppy gift basket includes all those essentials for training such as a collar, leash, clicker, puppy pads, treats, and a training manual. Cleaning and Sanitation: It might not be as glamorous as a spa basket, but much more practical and most appreciated by new puppy owners. Consider offering the new owner an assortment of enzyme cleaners and puppy safe soaps, poop bags, and a small container to hold the bags, House training manual, even a roll of paper towels because we all know puppies make mistakes,usually lots of them. Want to Try Your Hand at Making Your Own? Whether you first decide on the products that go into the gift or the container itself is a matter of personal preference. Both should be considered when building your gift. Are you ready to assemble and make a puppy gift basket that is uniquely yours. Find out how to make your puppy gift basket, step you step. If do it yourself is not your thing, you might like to check out these ready made baskets for a perfect gift ideas for a friend, colleague, or very special person who happens to love dogs. Here are a few suggestions that can be purchased directly from this website to Amazon. Remember, anytime someone purchases from this site, we receive a tiny commission which helps keep this site up, running and expanding. We appreciate your purchases.